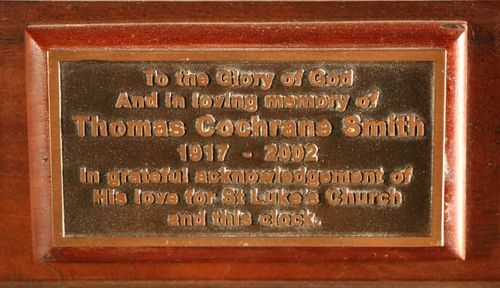 A plaque commemorates Thomas Smith for his services to the church and the church clock. Note : The clock was one of six turret clocks manufactured by London clockmaker Thwaites and Reed in 1828 for consignment to the fledgling Colony for use on public buildings. Commonly referred to as the 'Richmond Town Clock', it was installed at St Luke's in 1922, having first been used in the original St David's Church at the corner of Murray and Macquarie Streets, Hobart. The clock was not installed in the new St David's Cathedral when it was constructed in 1874 and it gathered dust for some fifty years before being given to St Luke's in 1922 by the Dean and the Cathedral Chapter. The clocktower was restored in 2004. The project created such interest in the Richmond community that a group of some thirty residents formed a Clockwinders Guild and a roster to attend to the twice-weekly winding of the clock. In grateful acknowledgement of his love for St Luke`s Church and this clock.